"It is the people of Martha's Vineyard who give voice to the Vineyard ""sense of place."" 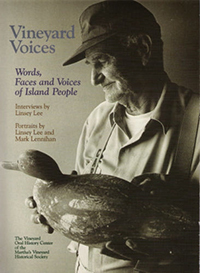 Here, in their own words excerpted from interviews with oral historian Linsey Lee, are the photographed portraits and stories of seventy-five Vineyarders, chronicling the continuity and the changes of life on the Vineyard over the last one hundred years. We find farmers, fishermen, neighbors, boat builders and summer people. There are stories of shipwrecks, race relations, ice cutting, rum running, one-room schoolhouses, whaling captains and whaling wives, Portuguese customs, Wampanoag heritage and more, chronicling a way of life that has continued for generations and is fast disappearing. "